Heat pressed shoulder, knee and back reinforcements prolongs the life of the suit, protecting it from wear and tear. The Kevlar gives the drysuit a high tear, puncture and wear resistance. The warm neck seal and separate neoprene hood suit gives added comfort. The front zip allows easy self donning. The cover on the zip protects the BCD from rubbing and keeps the zip clean from sand and dirt. Automatic outlet valve with filter makes it easy to keep clean. Under the inlet valve is a neoprene padding that diverts incoming cold air evenly inside the suit. The hose can be connected from any angle with the swiveling inlet valve. The suit is equipped with a telescope waist, integrated suspenders and a crotch strap which together make it even easier to put on and gives a neat fit for varying body heights. The suit comes with large bellowed Tech thigh pockets on both sides that are easy to open with dry gloves. On the flap there is a small pocket with zip and there are two elastic loops inside the pocket. 4 mm neoprene boots with latex surface reduce the need for extra insulation. Getting the right size boot prevents additional air from getting into the boots, which could create unwanted buoyancy. Heel strap retainers keep fins safely in place. 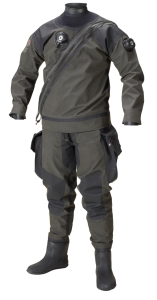 We recommend using X-Tex Finnfill thermal underwear together with your Kevlar BDS dry suit.